Effective deployment of the proposals for the sale and purchase links (ie, just the sale and purchase of text links) with the help of this exchange is very simple. Placing direct links HTML very effective form of online advertising and even "backward" burzhuynete becoming increasingly popular. Text links, designed in the form of ad unit with the help of service contain useful information. 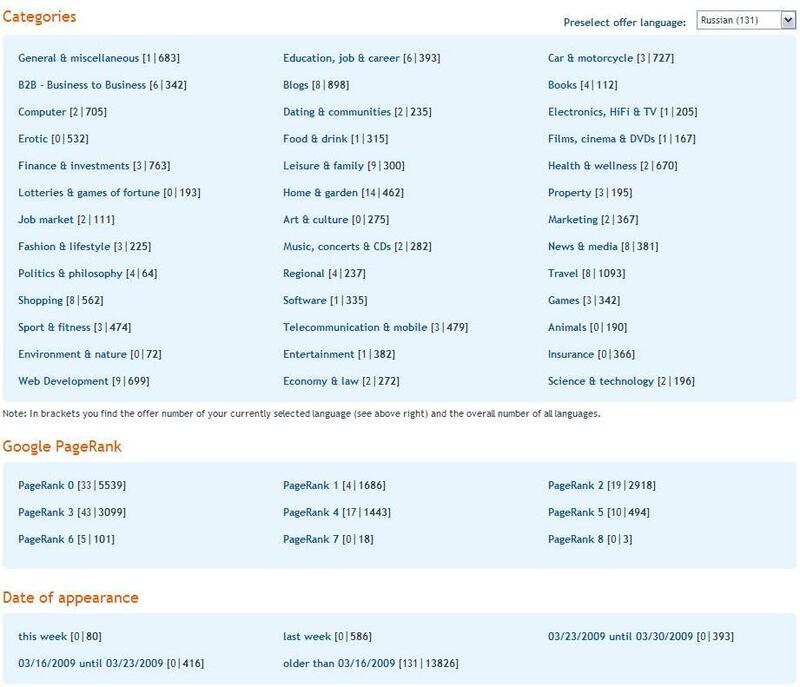 With the new service "Content-Links" and "InLinks" link located directly to the most valuable areas of a site: directly in the content, and the text links in the content are evaluated by search engines as most important in terms of relevancy. Currently in more than 75 000 places for the accommodation of the text links, 15 000 and 7 000 URL domains. All the sites are divided into 35 thematic categories. You can determine the cost of each link from the text. Your account has a calculator to calculate the average price. 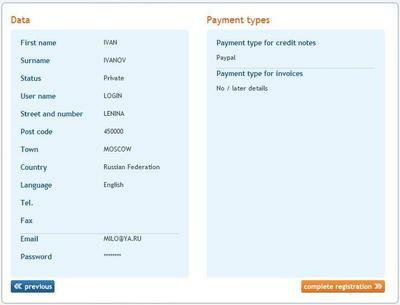 A test calculation of the value of links in the footer for Sapy:) gave 56 euro. 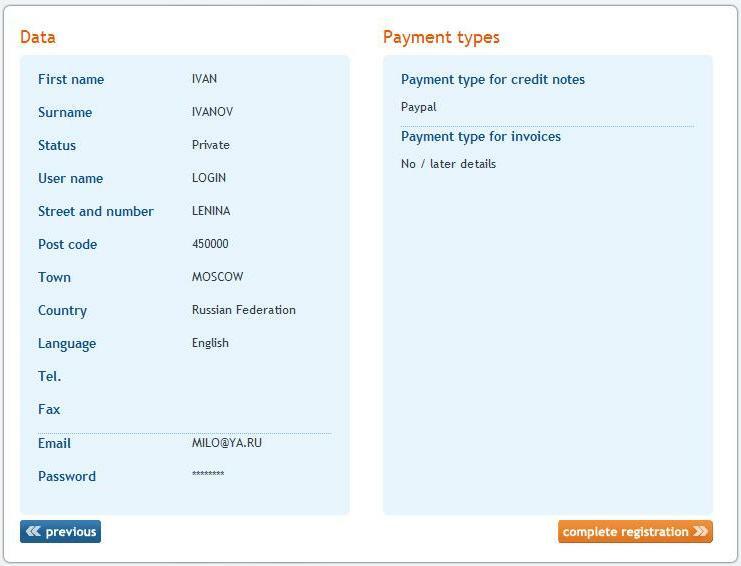 In addition, the exchange always round the final amount, ie, in this case € / USD 75. Also, Exchange checks all the new new proposals and will inform you about the unrealistic prices that you set. We turn now to Log on here (preferably for your humble servant). We fill in all fields according to the screenshots. 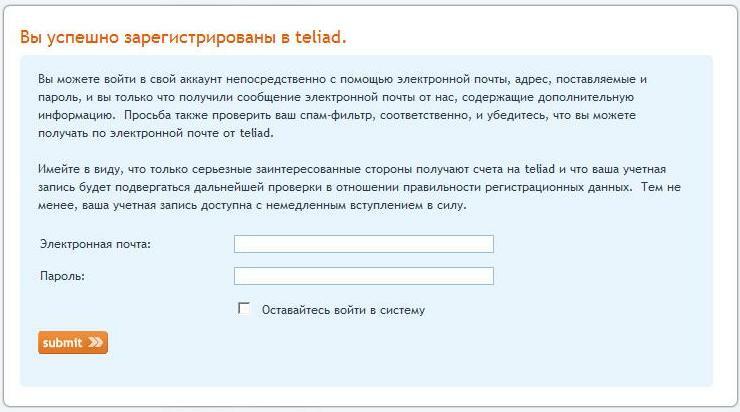 If something is not clear - see screenshot Russian. 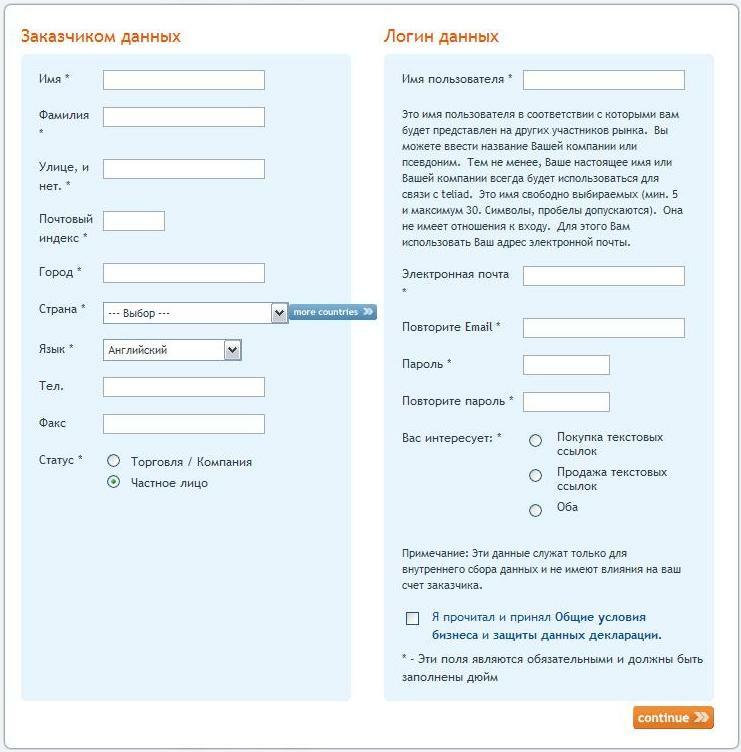 Then press the button "continue" and proceed to the second step of registration. Here you select the suitable way to get money as a seller of links and method of payment links, if you acquire a reference to the exchange. 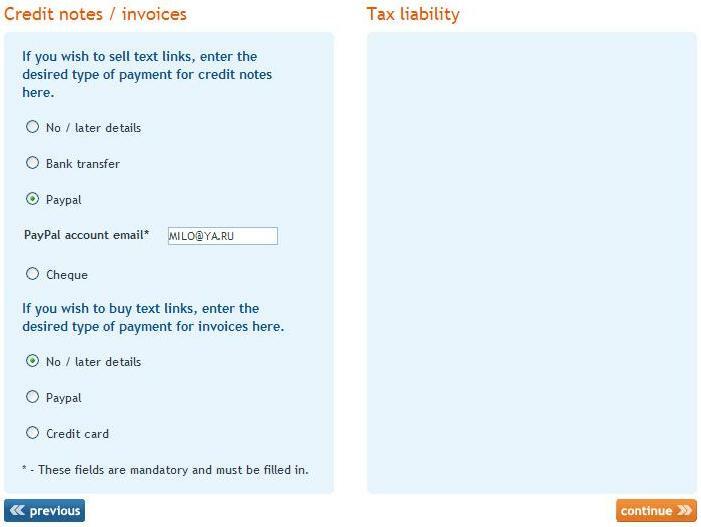 Credit notes / invoicesTax liabilityIf seller for text links, enter the type of payment. For the buyer, enter the type of payment here. Feel free to click the button "continue" and get another window with your data. Check, check, push "to complete registration and receive a confirmation of the end of registration. 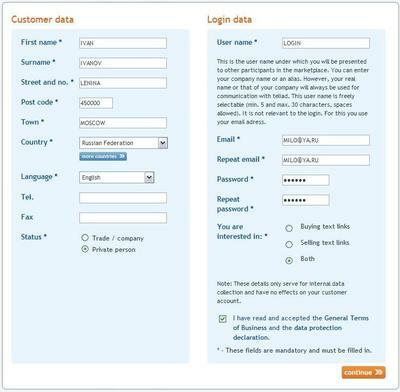 Enter your email address and password, click "send" and we are in the system. When you first visit you will be granted a bonus of 15 euros for the purchase of reference and test (if you have registered as a seller and buyer). 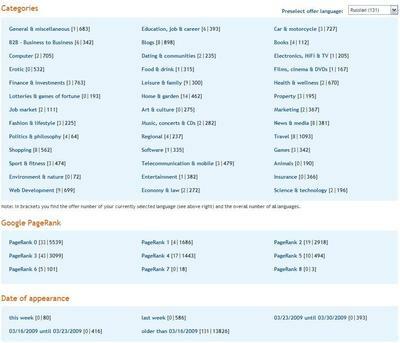 Also, we are happy contemplate what sites, with pr, of national and thematic accessories are available in the system. 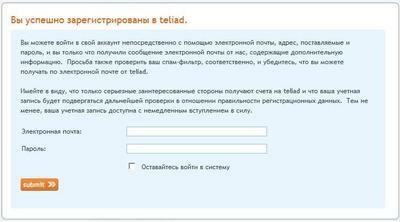 A pleasant surprise for me was the presence of 131 Russian-language site. Through the menu item "Make a proposal / Make Offer". 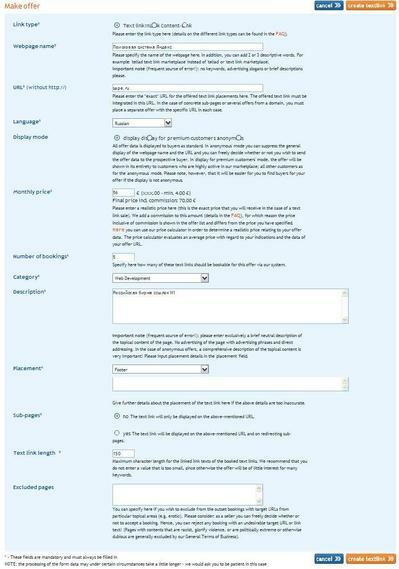 Once you have sent us a proposal, we suggest that you check the site for quality traits. If we have any requests for changes, we will inform you the details via e-mail. Please follow our instructions on the proposal form. Note regarding the inclusion of references to the text: You must manually set the text links at themselves after the order (you can find detailed information in the FAQ). 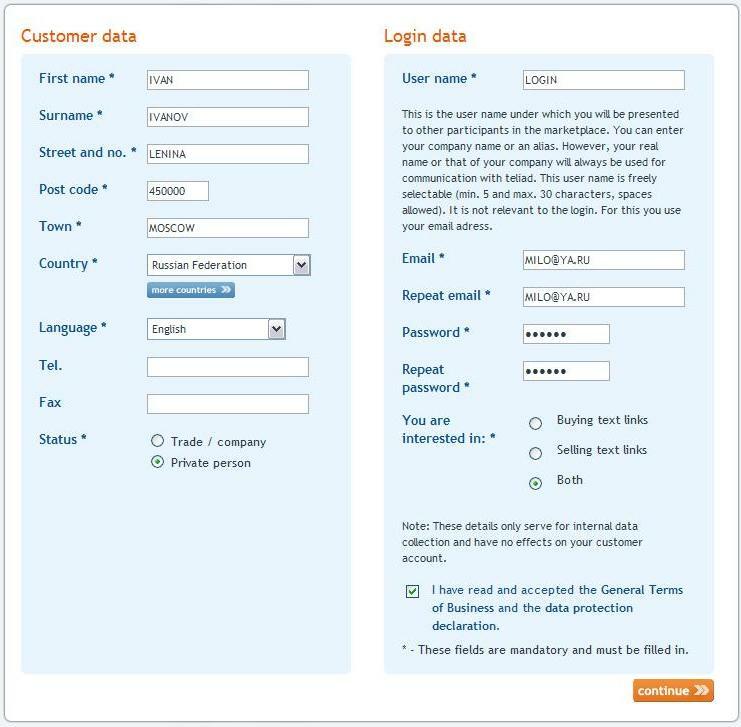 You need not include any codes or the PHP-script to your page. You will be informed by email when a buyer makes an order request. You can freely choose whether to accept the order. Then you just insert the link manually in your web page. You must decide what type of links you want to invite: regular block reference (InLink) or contextual links (Content-Link). You can find detailed information on frequently asked questions. Where would you like to place a link? You have the opportunity to place text links in different places on your site (such as header, sidebar, content area title etc.). Accommodation in the content area is more attractive to a buyer than a text link to link in the list below. Which suggest URL you would like to offer text links? You must put in a separate proposal for each URL. You need to specify the exact address, which will be referred to. If you want to invite a reference to a sub-page, you must specify the URL in your proposal. Please note that the proposed URL must be indexed in Google. What price you can ask? 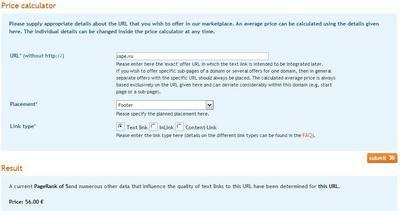 To determine a reasonable price, and compare your specifications with prices offered by other text links. Important factors include location, number of external links, page rank in Google and PageRank (details can be found in the FAQ). We turn now to the menu item "Make a proposal / Make Offer" and begin to fill out the form. Immediately the question arises about the type of selling links. What is the difference between the content links, inlinks, and simple text links? Link text contains an advertisement in text form with brief written information. This increases the relevance of search and thus increases the number of visitors. Text links can be placed at any desired position on the website (for example, in the content, in the navigation bar or footer). Content links are text links with descriptive content, written by the advertiser. The buyer could order a complete section or area of the site. The buyer sets a text link to the desired location within the section. You can specify the maximum number of characters in the text. Inlinks text links are established within the text, which the seller said. 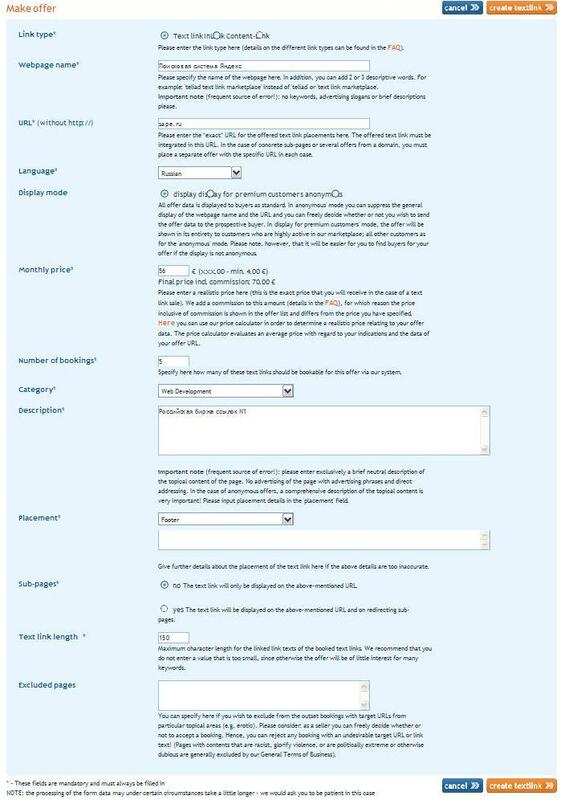 In the case of InLinks, the seller offers a specific bookable words "within existing (or future) of the text on the website, for example, in the article or comments in the blog. 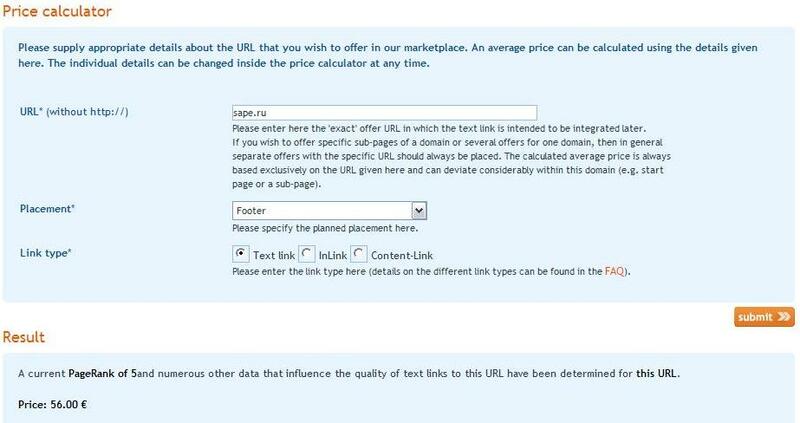 Unlike Content-Link, the buyer can not offer your own text, but only use proposed seller list of keywords. Nevertheless, buyers have the opportunity to suggest alternative keywords. We'll review the proposal and will notify you by e-mail. So, please wait 1 - 2 working days and a new sentence will be activated. In some cases, moderation may take a little longer. Please note that, take a few minutes before you can see his proposal to the status of 'Check' in your account. At the 1 review of the service, I finish, if force and time, 2 part of the review will appear shortly. And to start working with the service I think the information is sufficient. If there was wrong, or incorrectly translated - write in the comments immediately amended. Регистрация: Market buying and selling links "TeLiad"
» Биржа покупки и продажи статей "Liex"
» Почему поощрение сотрудников с помощью социальных медиа ― это правильный ход для бизнеса? 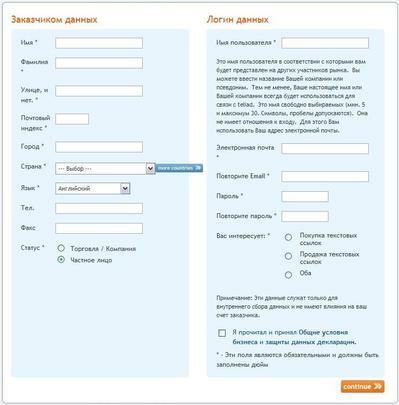 » 10 декабря: "SEO-Upgrade 2014"